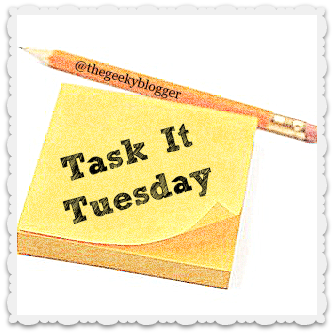 What, you ask, is Task It Tuesday? Every Tuesday, Felicia at The Geeky Blogger posts about a task she'd like to accomplish that week that relates to blogging/reading/challenges. I'm hopping on board this week. So last week I took this course at Coursera - "Get Organized: How to be a Together Teacher." But Chelsea, you might say, you are not a teacher! You are not wrong, clever reader! I am not! But I am a very busy stay-at-home mom with two young children to keep organized, plus two independent work lives and a blog to manage. I work freelance and have to self-motivate *and* self-organize to keep things ticking along. It's a lot of hats to wear, and a lot of balls to juggle, and stuff in a few other metaphors for being busy until you get the picture. And frankly, I think we're *all* busy people. Whether we work full-time, have children or don't, volunteer, participate in sports or support a team, have hobbies we're really into, provide care for other adults, are in school, are involved in churches, with our families, and so on. There's plenty to fill the hours of our days. But, that's a whole other blog post! Out of that course, I was asked to develop three tools - a weekly schedule, a calendar of events and deadlines, and a to do list for everything not on my plate this week. I really like the system so far, and I suggest you go check out the course. It's free, and you can just watch the videos and make your tools without submitting for grading/peer review and all that jazz. Update my 'books acquired' for 2015. I updated this a couple of months ago and I shudder to think of all the books I've added since. Get template posts together for the book tours and reviews I'm going to be posting next week so I can simply slot my reviews and any additional information in when I'm ready to do so. That's it. Update my inventory and get a jump on next week. What's on your to-do list for the week?